Accenture fielded a global survey of 3,600 business professionals– entry-level to management – from small, medium and large organizations across 30 countries to examine the opportunities and challenges of listening, leading and learning in today's digital workplace. 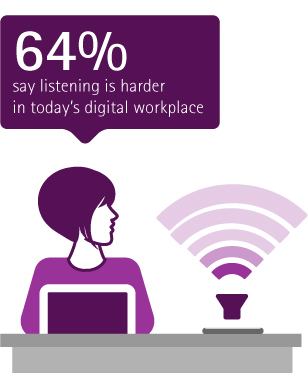 Listening is becoming more difficult in the digital workplace. 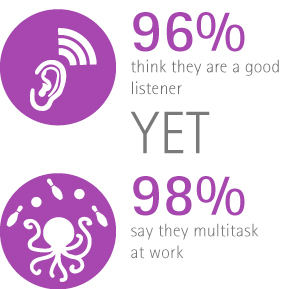 Most employees think they are good listeners yet admit to multitasking throughout the day. 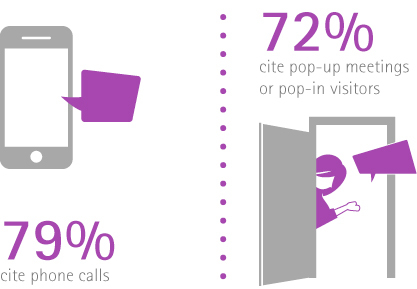 Two thirds say the constant distractions diminish their ability to do their best work. DO YOU CONSIDER YOURSELF TO BE A GOOD LISTENER? WHO SPENDS AT LEAST HALF OF THEIR WORKDAY MULTI-TASKING? What interrupts your workday most? Which of the following listening skills are most important in the workplace? Respondents value good listening skills – thinking before speaking, asking questions and taking notes are viewed as most important. Employees value learning opportunities, especially on-the-job training. Many get promoted or expand their role as a result of company training, and most agree that on-the-job training is the most effective form of learning in the workplace. Which of the following are the most effective types of training/learning in the workplace? Technology both helps and hinders effective leadership. While many employees see increased accessibility as a benefit, some view technology as “overextending” leaders by making them too accessible. Among the top challenges facing leaders today are information overload and rapidly evolving technology. DOES TECHNOLOGY MAKE LEADERS TOO ACCESSIBLE? What are the key skills and attributes for leaders today? Effective communication, ability to manage change and ability to inspire others are the most important leadership skills. An equal number of women and men asked for a promotion, up significantly from last year, when men were more likely to make this request. Millennials are more likely to ask for a promotion and a raise versus their older colleagues. WHO ASKS FOR A PROMOTION? WHO ASKS FOR A PAY RAISE? Which of the following statements best describes your current job situation? Job satisfaction has declined to 44 percent this year, from 52 percent in 2013. Which of the following responses best explain why you are not satisfied with your current job situation? This year, more respondents report long hours and a heavy workload leading to their dissatisfaction with their current job. WHO WANTS TO STAY AT HOME? of respondents – both men and women – said they would quit their job to be a stay-at-home parent if they could afford it financially. That’s up from 37% in 2014 . In November 2014, Accenture conducted an online survey of 3,600 business professionals – entry level to management – from small, medium and large organizations across 30 countries: Argentina, Australia, Austria, Brazil, Canada, Greater China, France, Germany, India, Indonesia, Italy, Japan, Malaysia, Mexico, Netherlands, The Nordics (Demark, Finland, Norway, Sweden), Philippines, Saudi Arabia, Singapore, South Africa, South Korea, Spain, Switzerland, Thailand, United Arab Emirates, United Kingdom and United States. A minimum of 100 respondents from each country participated, with 500 for the United States, 300 for Greater China, and 200 for Germany, the Nordics and the United Kingdom. Respondents were split evenly by gender and were balanced by age and level in their organizations. The margin of error for the total sample was approximately +/- 1.7 percent. To learn more, download the global research results or join the conversation in our dynamic interactive virtual environment.